Figure 6.1. (see p. 107) Tuojiangosaurus, a stegosaur from the Late Jurassic of Sichuan Province, China. Dumb as a dodo. Dumb as a dinosaur. Both of these expressions relate small brain size and unredeemable stupidity to an inexorable march towards extinction. We know extinction took those dim-witted unsophisticates, the dodos and dinosaurs, long before clever life forms like ourselves appeared. And in the pantheon of dumb and dumber, what is more celebrated than Stegosaurus? For not only did it boast a notorious "walnut-sized" brain, but allusions have been made to a second, larger brain in its hips. 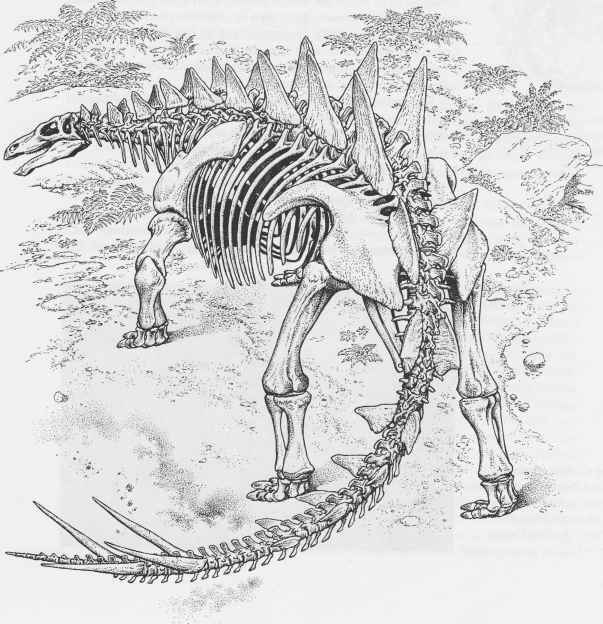 In this chapter, we will take up the matter of stegosaur intelligence, or at least its measurable surrogate, brain size, along with several other aspects of stegosaur paleobiology and evolution (among them, phylogeny, thermoregulation, and display). But let us here lay to rest the nonsense of lack of evolutionary success among stegosaurs. These dinosaurs did very well. They rose in diversity from their origin sometime in or before the Middle Jurassic to an acme of at least seven species in the Late Jurassic. From then on, stegosaurs declined to one or two species in the Early Cretaceous, and to one by the early Late Cretaceous. During their time on earth, stegosaurs spawned upwards of a dozen species and stood their ground both behaviorally and evolution-arily, often in a unique and complex manner. Stegosaurs rank today among the most familiar of all dinosaurs (Figure 6.1). As their name implies, stegosaurs (stego - roof; saurus -lizard) all have rows of special bones called osteoderms (osteo - bone; derm - skin), which develop into spines and plates along the neck, back, and tail. Other osteoderms - in the form of spines - develop over the shoulder blades. Once thought to have been positioned over the hips and called "parasacral," these spines are now referred to as a parascapular spines. Figure 6.3. 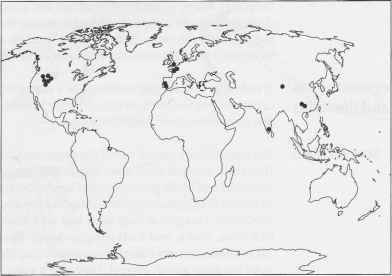 Global distribution of Stegosauria. suggest a herbivorous feeding style. The forelimbs in all stegosaurs are short and massive, while the hindlimbs are long and columnar. The toes of both fore- and hindlimbs ended in broad hooves. The striking disparity in limb proportions gave these animals a profile that sloped strongly forward and downward toward the ground when the animal walked (Figure 6.2). 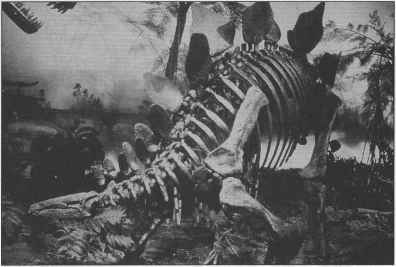 Stegosaurs spanned 3-9 m in length and weighed in at an estimated 300-1500 kg. By just about any standard, these were large animals, but still only of modest size when compared with many other dinosaur groups, particularly their herbivorous contemporaries, the gigantic sauropods. Tuojiang), Wuerhosaurus (from Wuerho)) and a final taxon, Dravidosaurus (from Dravidandu (the southern part of India)), the last-known stegosaur (early Late Cretaceous). None of these animals ever saw the debacle, whatever it was, that befell the dinosaurs at the very end of the Mesozoic. Stegosaur lives It's obvious that there is nothing like a stegosaur alive today, but their and lifestyles occurrence in the fossil record and their individual skeletons give us a few clues about their "wildlife biology." Stance and gait The general body plan of any of the stegosaur taxa gives the impression that these animals were more inclined toward the plodding than the sprinting end of the getting-around spectrum (Figures 6.1,6.2, and 6.4). In all but Huayangosaurus, the forelimbs were short and stocky and the hindlimbs, elongate as they were, had very short lower limb segments (the tibia, fibula, and foot) compared with the length of the femur. All of these features conspire to suggest that these animals were not built for great speed. Instead, they give a sense of great stability and strength, almost as elephants do today. As we have already noted, stegosaurids have much longer hindlimbs than they do forelimbs. Indeed, this disparity in limb length is a shared, derived feature of that group of stegosaurs that excludes the more basal Huayangosaurus. Not surprisingly, it has some important biomechanical consequences for stegosaur locomotion, which have been studied by R. A. Thulborn of the University of Queensland. As pointed out by Thulborn, the maximal stride for the short forelimbs is limited to the arc available from all the (short) limb elements. In the same way, the long hindlimbs ensure that hindlimb stride was also proportionately long. As a consequence, stegosaurs had a problem: at the same cadence (the rate of feet hitting the ground), the hindlimbs would have been able to outrun the forelimbs. At high speeds, therefore, the rear end of the animal would have overtaken its head: not a likely scenario. Thulborn observed that the problem could be avoided in two ways: (1) running stegosaurs could have drawn up the forelimbs up from the ground (i.e., temporarily been bipedal while running) or (2) stegosaur locomotion may have been limited to a slow walking gait. 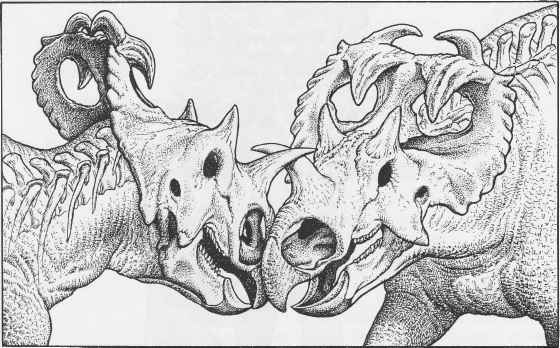 The shear bulk of a stegosaur makes the first option unlikely (although see below for discussion of bipedal stegosaurs in a feeding context) and the second option far more tenable. So far, we have only anatomical observations by which to judge walking or running speeds in these animals; no footprints or trackways are yet known. Nevertheless, it appears likely that the pace of stegosaur life was leisurely, on the order of 6-7 km/h maximal speed. Among contemporaries, stegosaurs may have been slower than the multitonne sauropods or such large ornithopods as Camptosaurus. More critical to health and longevity, stegosaur running speeds were much less than those of both the small and large theropods that must have hunted - and devoured - them. Indeed, small theropods such as Ornitholestes could have run circles around stegosaurs (what Ornitholestes would have done when the stegosaur was caught is quite another matter; see Chapter 12).